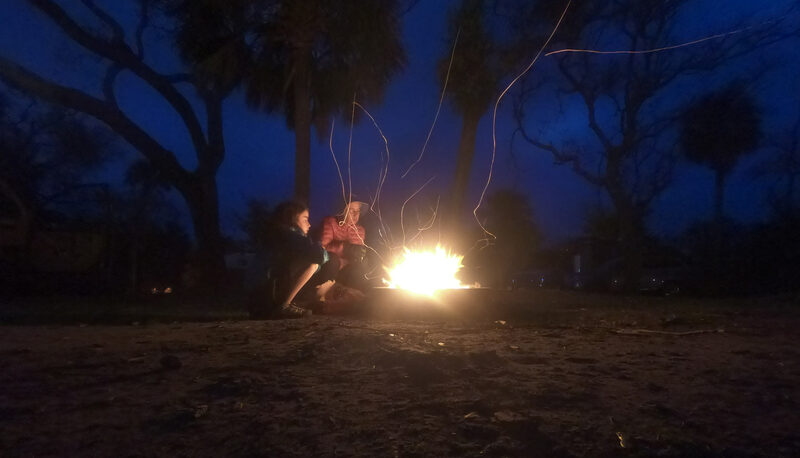 Surprisingly remote, unexpectedly beautiful, and dripping with southern charm and Spanish moss, a trip to Hunting Island State Park will have you rethinking your impression of South Carolina and have you wondering what took you so long to come around. So often when you think of South Carolina, you might never make it past visions of I-95, South of the Border, and Myrtle Beach, as these are the things most people see when they cruise through 'the other' Carolina. It certainly has been our experience, and we've lived on the central East Coast going on 50 years. For us it has just been another state to go through on the way to Georgia and Florida. But this is the trip that changed all that – for good. Rare is the occasion that we just drive from one place to another without stopping to see something great. 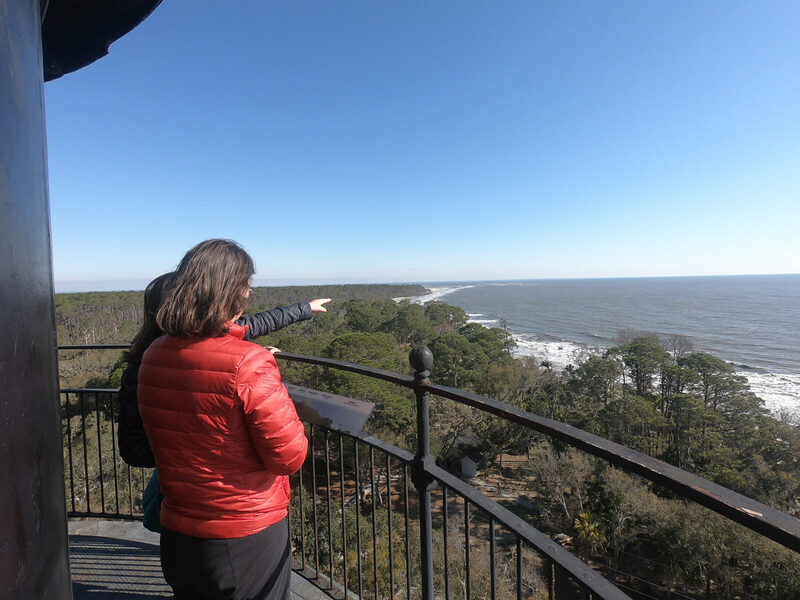 If there is an interesting museum, nature center, or hike on the way from point A to point B, Campfire Delight will find it and South Carolina has many diversions worth seeking out. 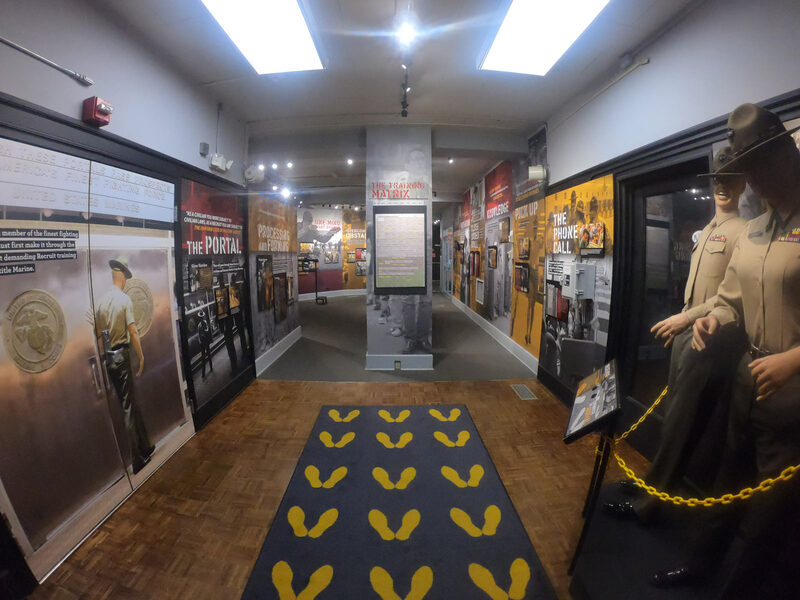 The Parris Island Museum, on the grounds of the namesake Marine Corps Recruit Depot, is a combo sort of experience that covers the history of the United States Marine Corps (USMC), and the surrounding Port Royal region. A self-guided tour begins in the rotunda with a timeline tracing the evolution of Parris Island from its Native American beginnings to a Naval Station to Marine Barracks to finally a Marine Corps Recruit Depot. Watch the fascinating film on the recruitment and basic training experience To Make a Marine. The east wing of the museum features exhibits on the local history of the area from the Ice Age to American Revolution to the Civil War/Reconstruction to Spanish American War. The main hall outside the Native American exhibit even includes a centuries old dugout canoe which dates back to 1300-1420 A.D! 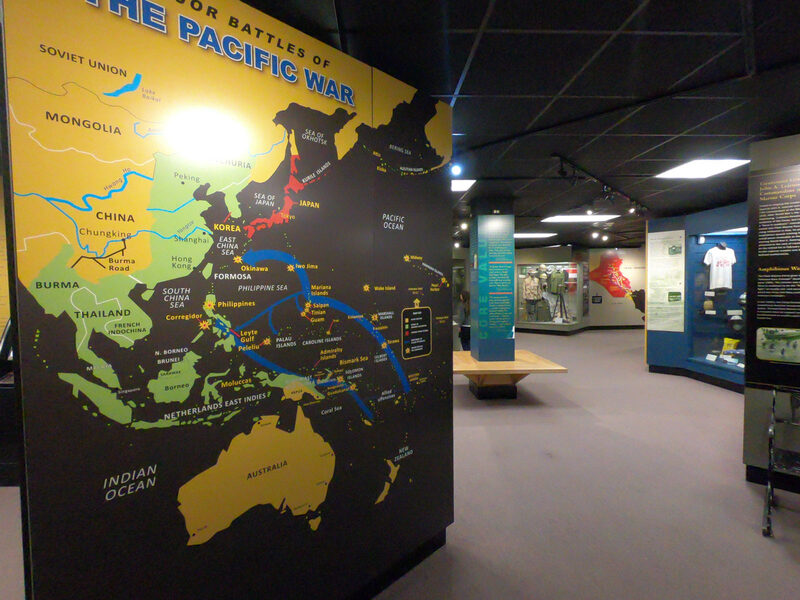 Upstairs is the Modern Marine Wing – traditions, military history, and modern methods in Marine missions from First World War to the present day are all presented in bright, beautifully designed, Papyrus-less font displays. Weapons, uniforms, and other unique artifacts help bring to life the many military engagements that the USMC has been involved. The museum is on an active military base – must be US citizen and have ID ready at the armed gate as well as your vehicle registration and proof of insurance. 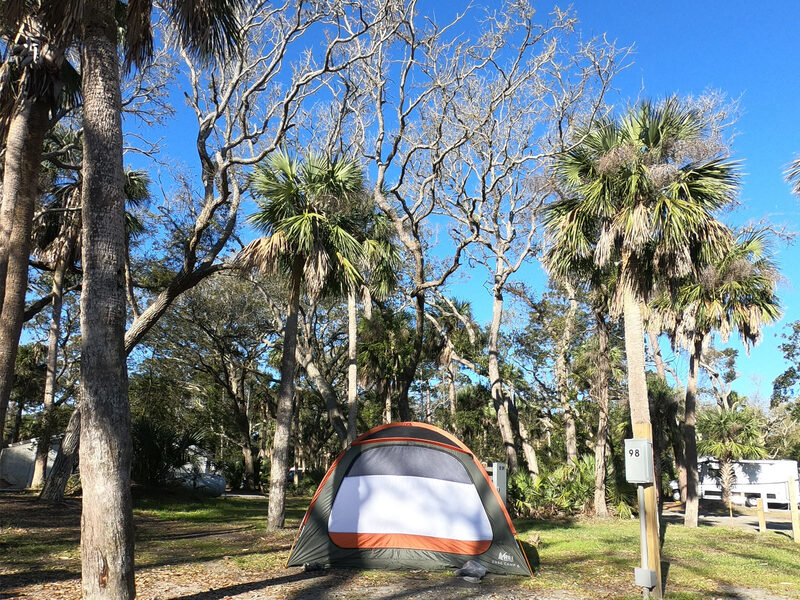 Confirming our earlier prediction that the South Carolina State Parks run a tight ship, Hunting Island State Park is truly a wonder of cleanliness, efficiency, and courtesy. 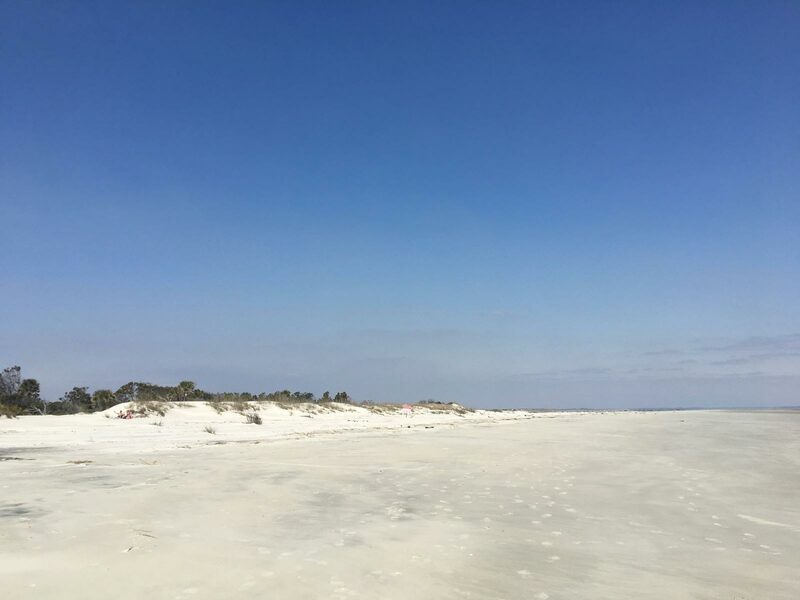 Hunting Island itself is a 5,000 acre sub-tropical barrier island featuring five miles of undeveloped pristine beachfront with thousands of acres of salt marsh and maritime forests to explore. Beautiful panoramic views abound which at times will have you wondering if you have been somehow magically transported to a salt marsh version of the savannas of Africa. Easy check-in with super friendly staff, this quiet 100-campsite facility is well maintained and frequently patrolled by the park rangers. The ocean is just a short walk away from camp - with tidal pools, very few people, sand dollars, numerous olive shells, and sea urchins. A family favorite ocean activity was watching the very entertaining hermit crabs exchanging shells on a quest to locate the perfect home - until an even better one comes along. 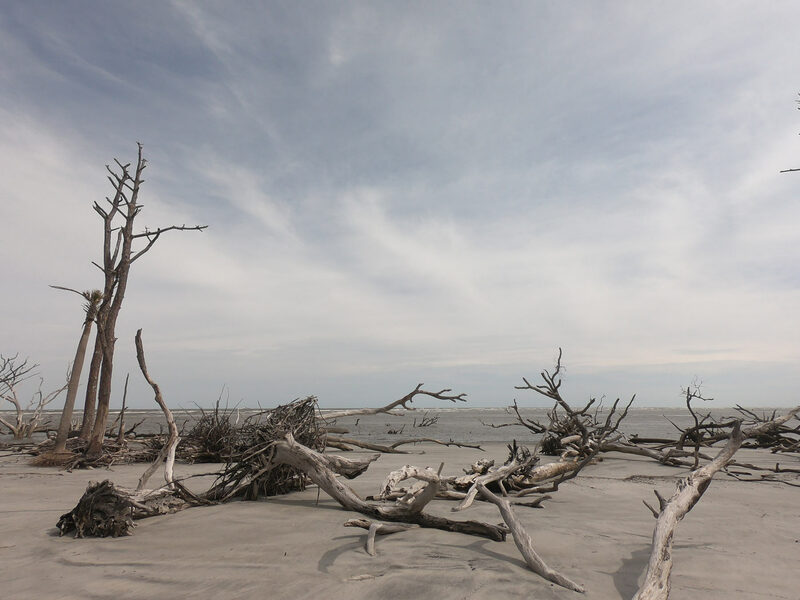 Advance reservations needed - Hunting Island State Park is the single most visited state park in South Carolina. 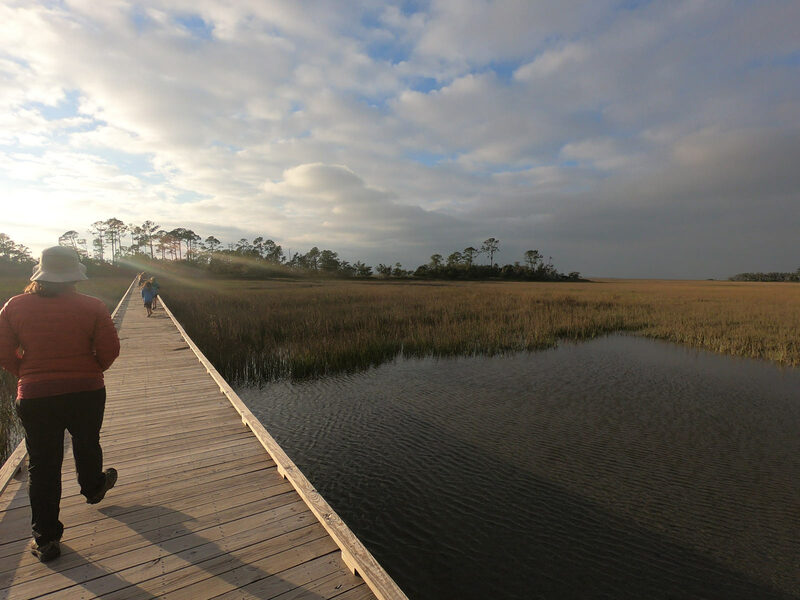 Nature Center Scenic Trail is a 1.5 mile round trip through a thick sabel palmetto low-country scrub that empties at the newly formed Little Hunting Island – one of the very few positives of 2016's Hurricane Matthew which otherwise destroyed a huge swath of the eastern seaboard. On the north end of the beach are recovering oyster beds, while the south end has the “Boneyard Beach” look. Both locations have the look and feel of a Hollywood deserted island movie set, are fun to explore, and could easily be made into a full day excursion. There is no drinking water or facilities to be found once you leave the Nature center and there are exposed pipes and hurricane produced debris among the fallen trees – so shoes are a must. The Nature Center itself has live animal exhibits – including a variety of native turtles including the threatened Diamond-backed terrapin, plus box turtles, corn snakes, king snakes, fish, alligators, toads, and various other reptiles and amphibians. Certainly enough to enthrall the reptile and amphibian lovers in your crew. Our resident expert reports that all the critters looked exceptionally well taken care of and that the displays were well done. Another feather in the cap of the SCDNR. Fishing Tackle Loaner Program: borrow rod and reel at Nature Center for use on the pier. 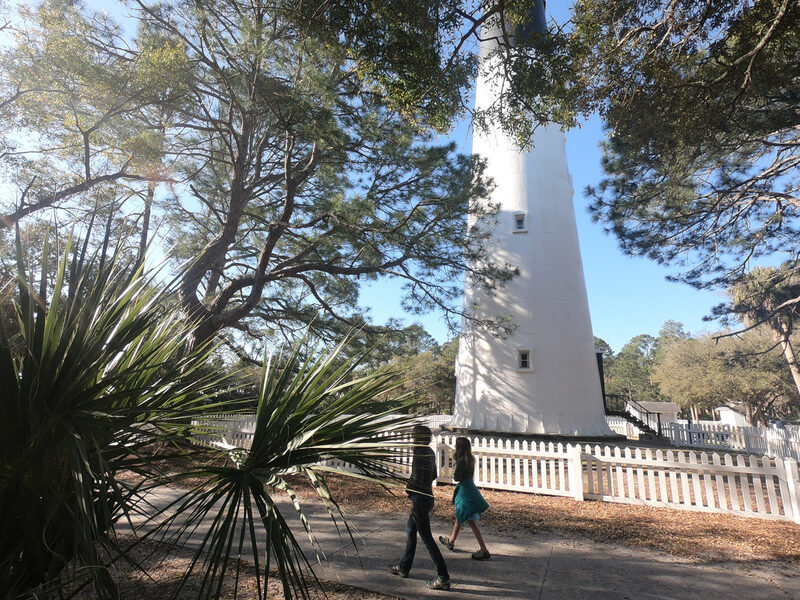 If climbing every lighthouse on the Atlantic is on your bucket list, the Hunting Island Lighthouse needs to be on it. 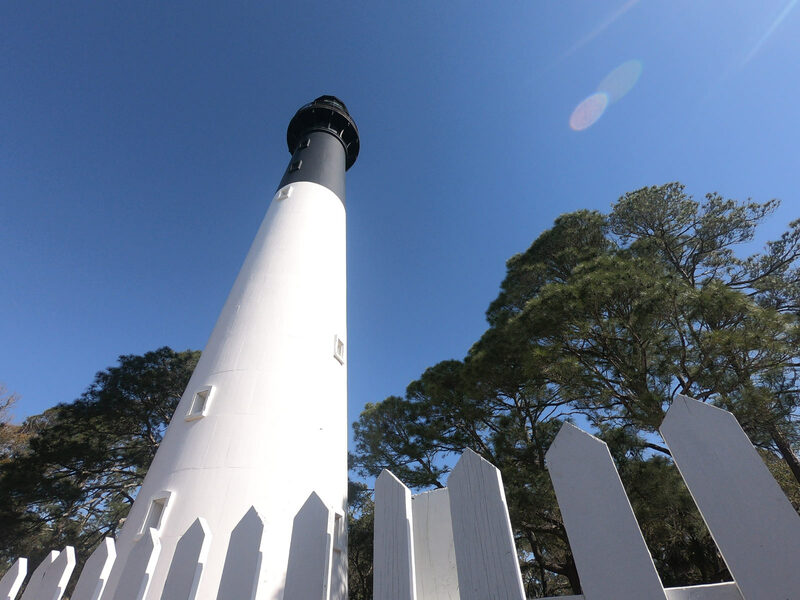 The only lighthouse that can be climbed in South Carolina is on Hunting Island and it is a great specimen and value at a reasonable $2/person to climb the 167 stairs to the top where breathtaking views of the surrounding coastline await. 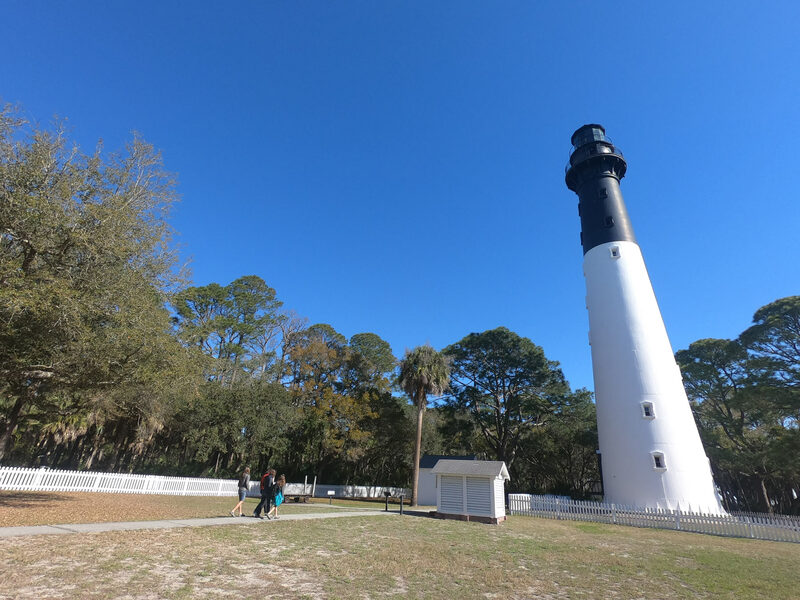 On the National Register of Historic Places, the Hunting Island Lighthouse, built in 1859, was moved one mile in 1889 to its present location to avoid the encroaching tide. The beam was a second order Fresnel light powered by fifty pounds of rendered pig fat which had to be carried up the 167 wrought iron stairs every day by the lighthouse keepers. A technical wonder of its day, the light from the lens was visible for 17 miles. Several outbuildings and some very knowledgeable park volunteers help visitors understand the very lonely secluded lives of the immigrant families who tended the lighthouse until is was decommissioned in 1933. 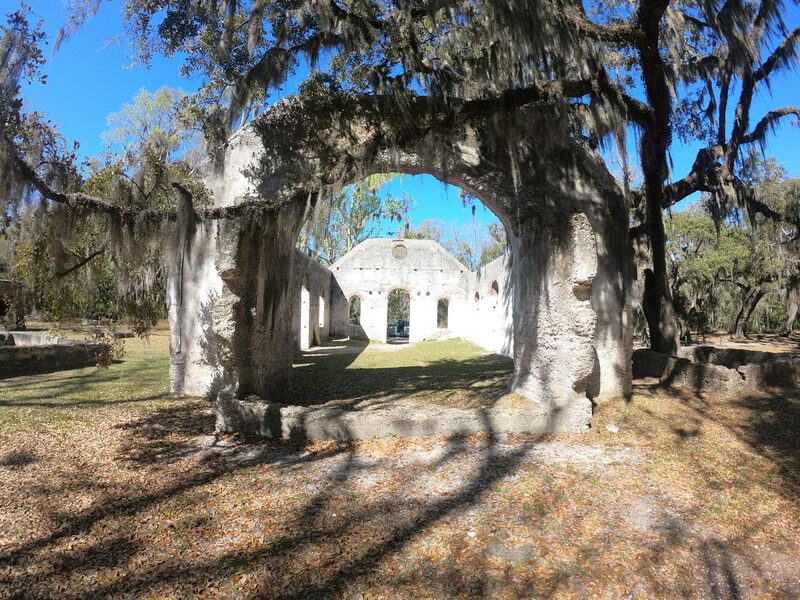 At first glance the ruins of Saint Helena Chapel of Ease immediately makes you think of ancient church structures that you might find in the English countryside and little about that impression, except the presence of Spanish moss, will change as you wander the grounds. Built around 1740, tradition has it that the chapel was destroyed by a forest fire in 1886 and never rebuilt. 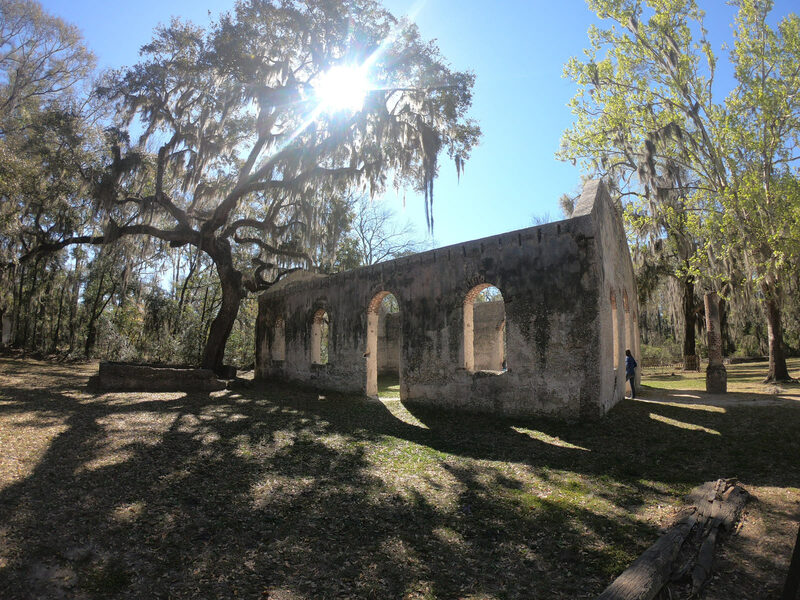 Designated as a Chapel of Ease to serve church members - mainly plantation owners and their families - who were unable to make the trip to the main church of St. Helena in Beaufort some 10 miles northwest. Graceful brick arches, original plaster walls and centuries old graves all contribute to the beauty of this time worn ruin. The grounds are visually fascinating and a prime example of tabby construction popular throughout the South. 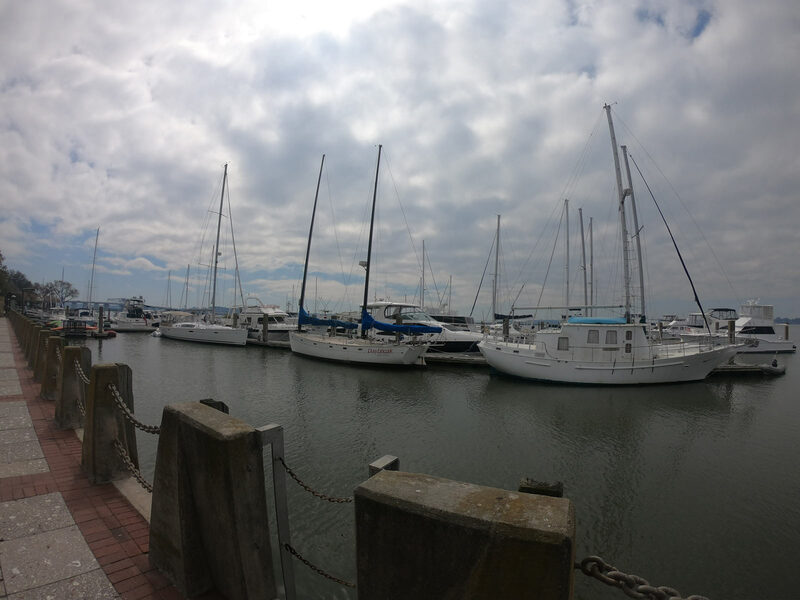 It would be hard to bypass a visit to historic Beaufort on any trip to the region. 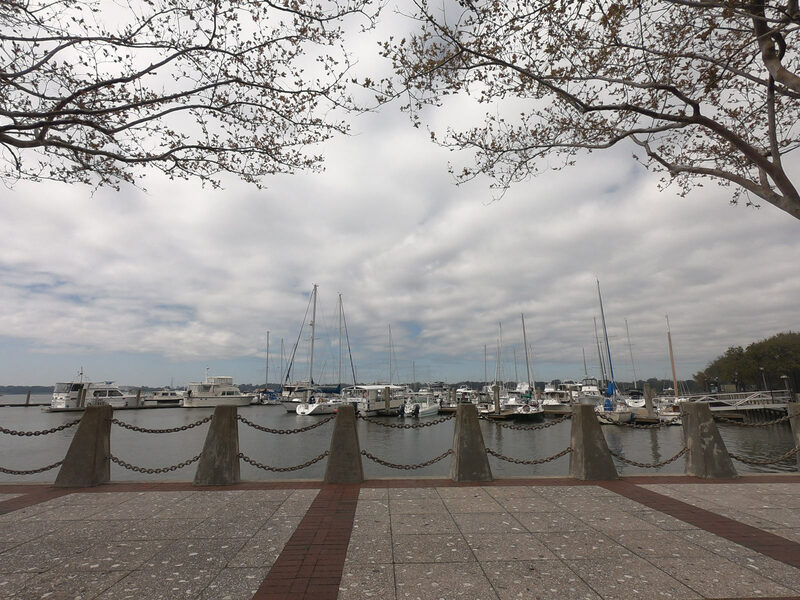 At the very least drop into the waterfront to take in the sights of passing sailboats as they make their way down the Intracoastal Waterway. If you're lucky you might even witness the Woods Memorial drawbridge open to allow for some of the taller masted boats to pass underneath. Grab a coffee or ice-cream and enjoy one of the wooden porch swings along the Beaufort River waterfront. Parking is a reasonable $1/hour and carriage, kayak, and bike tours are available on-site to tour historic Beaufort. First established around 1512, Beaufort is best known for its Civil War-era antebellum mansions (including the Big Chill House) and its Southern charm. One of our most memorable outings, we took the the 1/2 mile round trip Marshwalk Boardwalk Trail to watch a sunset that we won't soon forget. In fact, it's the hike and sunset that forever changed our opinion of the South Carolina Lowcountry. Unobstructed panoramic views out over several thousands of acres of salt marsh with the Harbor River beyond. 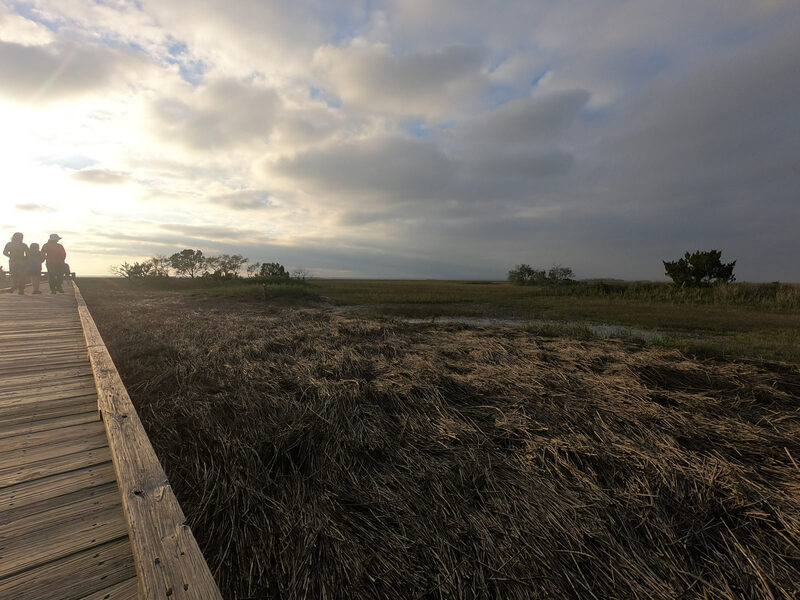 If crabbing is your thing, then it is an excellent location with a large deck that juts out into the salt marsh and plenty of comfortable seating. Bring warm clothes in the off-season, and plan for mosquitoes during the warmer months. 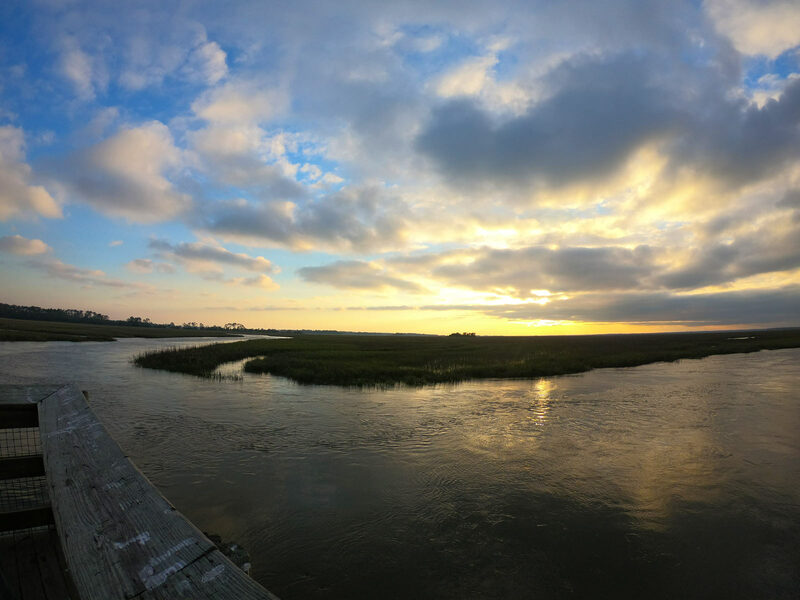 Leave plenty of space on your camera to capture a gorgeous Lowcountry sunset. When you register be prepared to show your reservations confirmation and photo ID.